I’ve seen a few other lenses as well, but these are the most common. The one I shot was fitted with the f2.8/80mm Ennit in the Synchro-Compur shutter. One thing that’s nice about the Super Baldax is that its lenses all use the 40.5mm filter thread which makes it pretty easy to find whatever filter/shade you desire. Like all Baldas, the camera has a very easy and efficient film winding mechanism where you don’t need to look at a red window in the back to know which frame you’re on – like the Super Isolette and Super Ikontas. Very cool! I like this camera!! 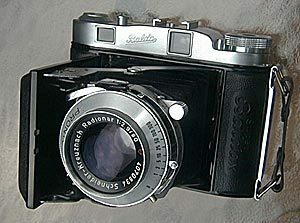 It isn’t as heavy and built of generally lighter materials than the Agfa Super Isolette. 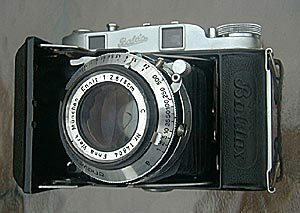 I also shot the 6×9 Baldalux/Baldafix. This is a basic and simple camera… no rangefinder, its only advanced feature is double exposure prevention. Film advance is via the usual “look at the red window in back to see which frame you’re on” method. 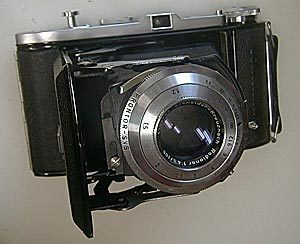 The camera is simple and straight forward with a good lens, the Schneider-Kreuznach f4.5/105mm Radionar set in a Prontor-S shutter. Solidly built, nice camera. 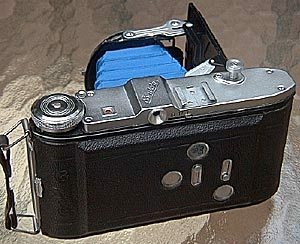 Load film in normal manner – close back and advance using knob to frame one with the red window open and holding the serrated counter lever (on back under and right of the wind knob). When frame 1 is reached in the window, close window and release serrated tab, and your counter (on the side of the top plate above the hand strap) should be at 1. Once an exposure has been made, advancing and releasing shutter double exposure prevention is one counter-clockwise turn followed by one clockwise turn. This advances the film, advances the counter, and releases double exposure prevention lock. Ideally, there’s no need to open the red window after the first frame has been set! The red dot twixt f11 & f8 is the hyperfocal aperture. Set it here and the focus will (mostly) be right on if you set the distance at the corresponging red dot or distance number on the focus scale. In other words, the depth of fied is supposed to help guarantee “in focus.